There is nothing like a hot chocolate to warm the soul, and being rather chilly today, I think I will make some. 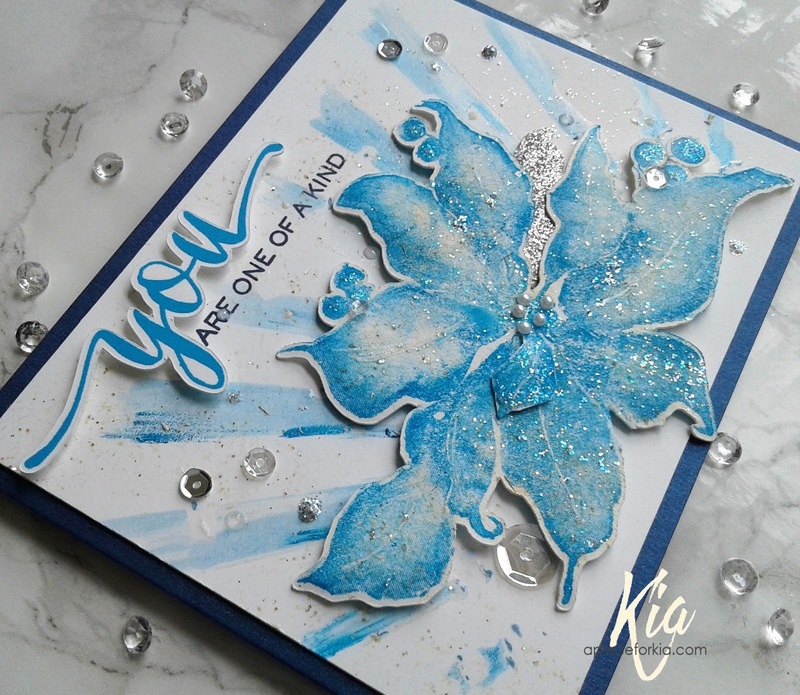 I used the new 6x6 Snowflake rubber stamp by Frantic Stamper for my background and matted with the blue card stock. I then added the Snowflake Border die along with the Cup of Cocoa that I attached on foam dots. 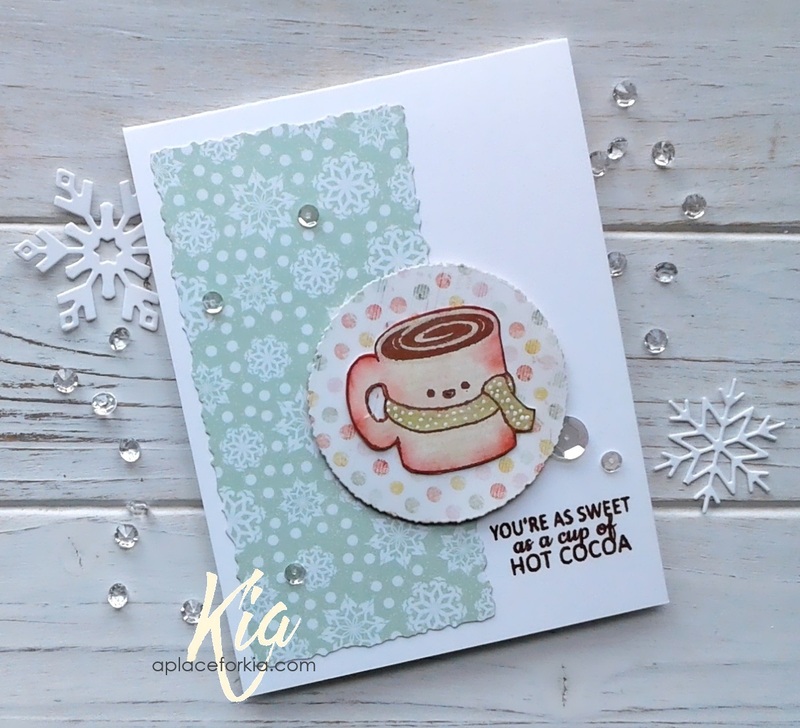 I stamped the sentiment from the Hot Cocoa Sentiments stamp set with a few sequins to finish. Now it is time for cocoa! Thank you for visiting. 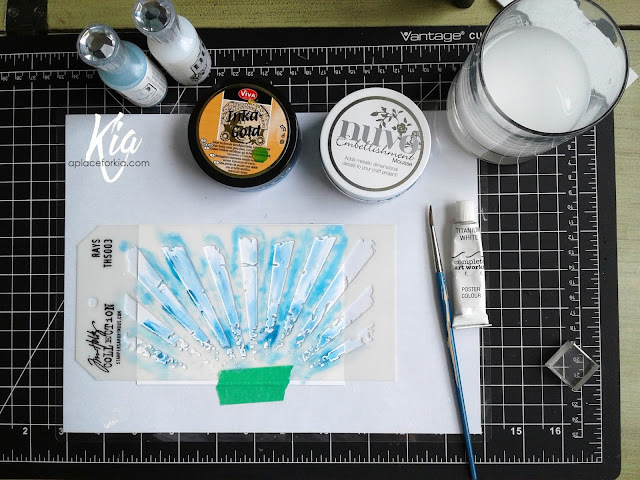 Products: All dies and stamps from Frantic Stamper, Tim Holtz Distress Inks Stormy Ocean, Simon Says Stamp Intense Black Ink, Neenah Solar White Card stock, Fabriano Hot Press Watercolour Paper, Foam Dots, Sequins. 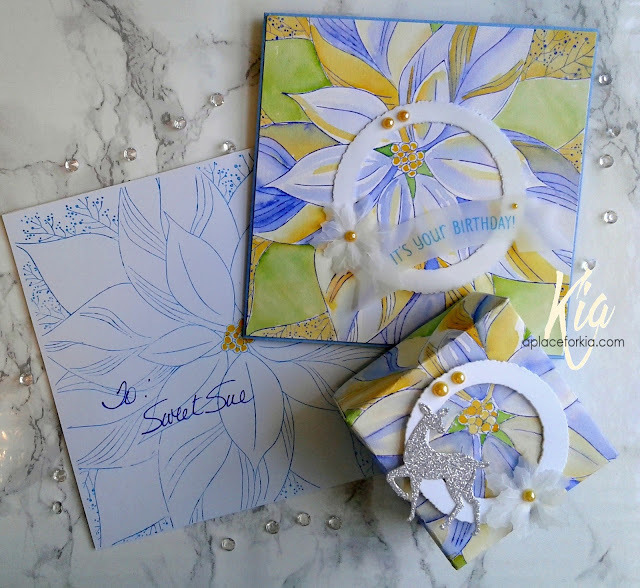 I am up on My Sweet Petunia's blog today with this gift set that I made for my friend's December birthday. And, there is a video showing my process as well, which I will link to at the end of this process. I wanted to make Sue something special for her birthday, so I decided to make a matching set for her. I painted the card and box on Fabriano Hot Press Watercolour Paper, which was folded into a 6x6 card, then mid way through, changed my mind and decided I wanted a blue base, therefore I needed a blue box bottom. The key to making the box is having the lid a bit bigger than the bottom, so it will fit snugly inside. On the My Sweet Petunia blog I also have pictures of the process and a little tutorial. Thank you for visiting today. See you next time. This is Peace over a Winter Village. 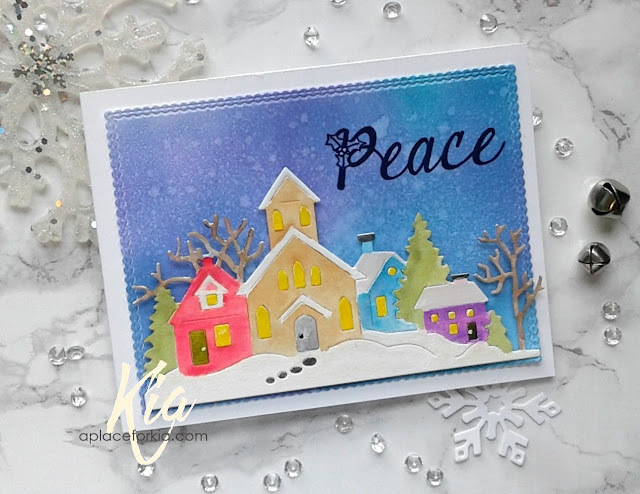 This little winter village die is part of the Christmas and Winter release at Frantic Stamper. 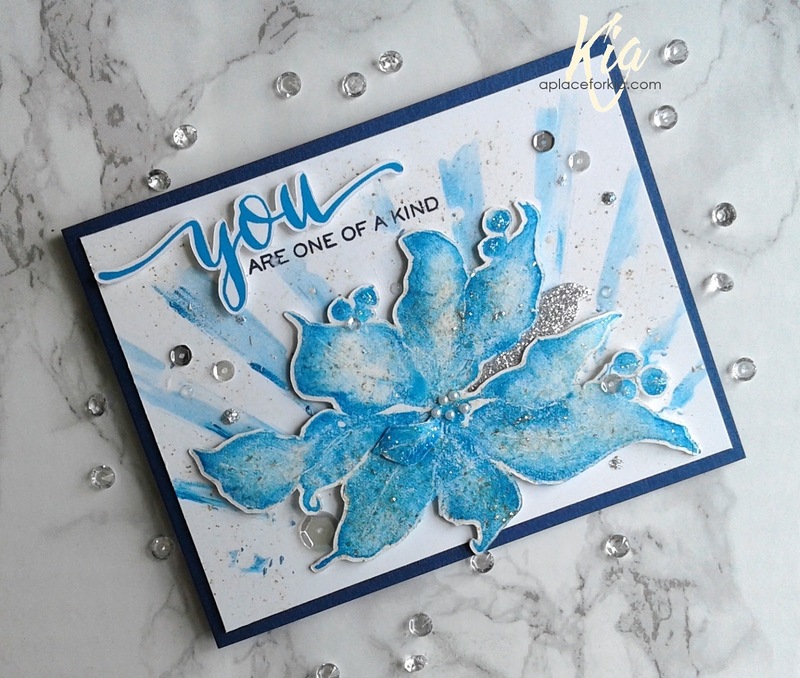 To start this card I first die cut the background panel using card stock then sponged on the Tim Holtz Distress inks until I was happy with the colour combinations. I then flicked on droplets of water and let sit for a few before drying with a paper towel. I finished by stamping the sentiment Peace, which is from the Joy and Peace stamp set. For the village, I die cut using watercolour paper, and coloured with my Zig brushes, painting different parts of the village to ensure no running of colour. For extra dimension I attached the village to my card base on foam tape, and that was it. Nothing more needed to finish this card. Products: Frantic Stamper Winter Village Die, Frantic Stamper Joy and Peace Stamp Set, Memory Box Scalloped Stitch Trimmings Die Set, Tim Holtz Distress Inks, Zig Clean Colour Brushes, Neenah Classic Solar White Cardstock, Fabriano Hot Press 140lb. Watercolour Paper, Foam Tape. Did you know that today, November 24, 2017 is "Celebrate Your Unique Talent Day". 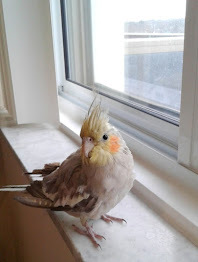 I hope you will have some time to visit with the team from My Sweet Petunia, better known as MISTI, to see what we have done for this day. It is and has been a joy for me to be on this team. It is "unique" from other teams in that we "travel" with the products and our MISTI's and share our ideas with all of you. 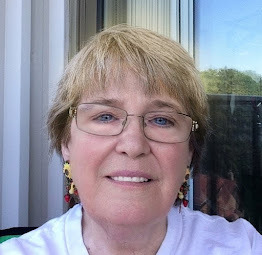 There is one person who has made this possible, and today I would like to celebrate her. You probably know her, she is the Uniquely Talented Creative Inventor of the MISTI, as well as the Creative Corners, Iliana Myska. If not for Iliana, I would not be a stamper. I was very lucky to meet Iliana at the Creativation Show back in January 2017. 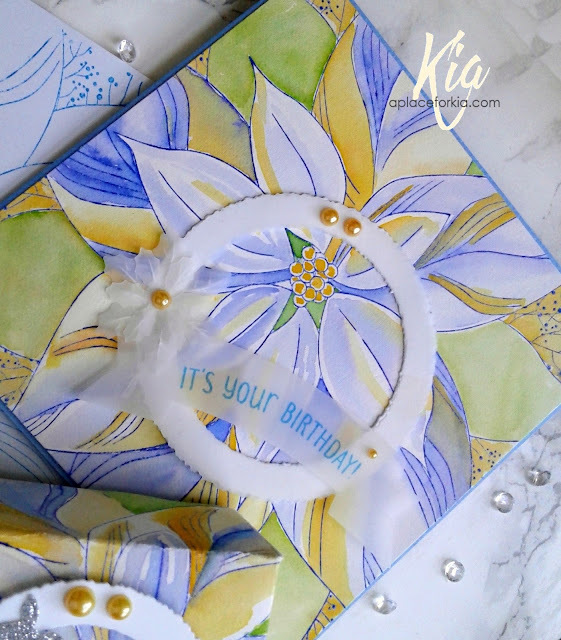 Did you know Iliana has been in to paper crafting since 2001? She has a lot of experience in this industry. She is a wife, mother, card-maker, does scrap-booking and now an inventor - wow! Iliana has worked very hard to bring this incredible tool to market, and it has been a long and sometimes difficult process, but she prevailed through it all. And it has not always been fun. I would like to honour Iliana today with this card I made just for her. My plan was to make a Unique card, one that Iliana will be able to keep up through the holiday season. Prizes ... yes we will have prizes too! We will give away winner's choice of an original or mini MISTI, drawn from everyone who comments on every stop of the hop. The deadline for commenting is Monday, November 27th at 12 noon CT. Here are the pictures of my process and my final card. Steelblue. I flicked on some white acrylic paint and added Nuvo Crystal Jewels as well. 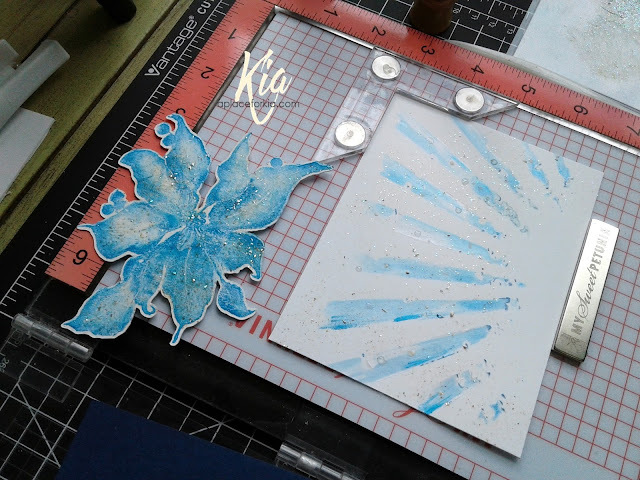 I then started on my flower using only one colour of Tim Holtz Distress Ink in Salty Ocean. I am building the colour here. Inking the edges of the stamp and lightly dragging across the stamp before stamping. It is all done via dry stamping. This is where the Misti is a must have. I have already done at least 15 passes at this point. I continued this process until I was happy with the look, then ran the image through my ScanNCut, as I do not have a die for this image and placed it back in my Misti along with the negative. To my white work surface I added a dab of White Opal Liquid Pearls and a dab of Ice Stickles. I dipped my stencil brush in the liquid pearls swirling to add to the bristles then pounced very lightly on my flower. I did the same with the ice Stickles. I did the same with my stencilled panel. A special card deserves a special card base, so I attached my panel to a blue metallic card base. I styled my flower then attached the poinsettia on dimensionals. For my sentiment I stamped the "you" using the Salty Ocean and made several passes to ensure the colour was deep. I then ran this through my ScanNCut, as once again I did not have the die. 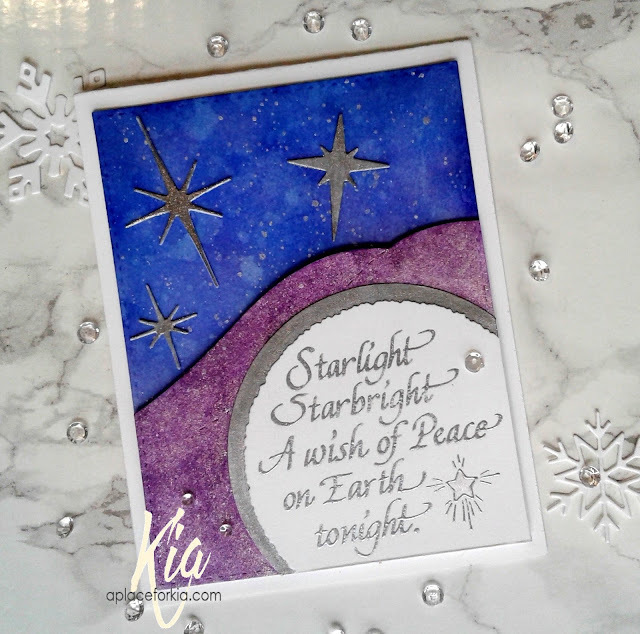 I then stamped the rest of the sentiment using Chipped Sapphire Distress Ink, and finished off my card with stickles on the grapes, along with adding a single die cut leaf in silver glitter card stock. 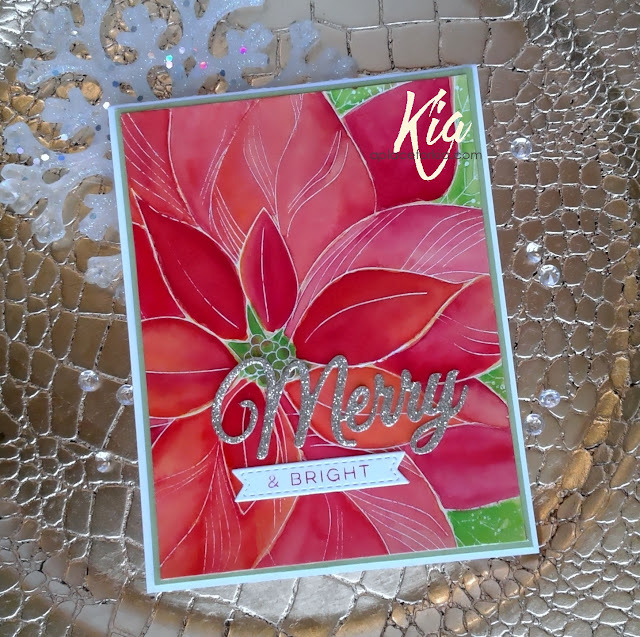 I added sequins and pearls to the centre and added in the tiny leaf that I had cut off from the bottom of the card. A close up showing the sparkle. As this is for Iliana I will finish the inside and pop it in the mail. I hope she enjoys this card and all the cards done in her honour today. There is a store-wide sale on at My Sweet Petunia with 20% off, calculated at check-out, until Saturday, December 2nd, 2017. Following is the list of the participants in today's hop, next up is Chris. Products Used: My Sweet Petunia Mini and Original MISTI, My Sweet Petunia Creative Corners, My Sweet Petunia Bar Magnet, Penny Black Scarlet Majesty Stamp, WPlus9 Hand Lettered Thanks Stamp Set, Altenew Peony Bouquet (silver leaf), Tim Holtz Rays Stencil, Tim Holtz Distress Inks Salty Ocean, Ranger Ice Stickles, Ranger Star Dust Stickles, Ranger Liquid Pearls, Kaiser Pearls, Shine Blue Satin Metallic Cardstock, Neenah Classic Solar White Cardstock, Silver Glitter Cardstock, ScanNCut CM350, Sequins, Nuvo Crystal Jewels, Nuvo Embellishment Mouse Cornflour Blue, Viva Decor Inka Gold Steelblue, White Acrylic Paint, Stylus, Dimensionals. I have had this stamp set on my desk to remind me to make a Christmas card with the ivy and berries. It ended up being a quick card to make, and I quite like it. 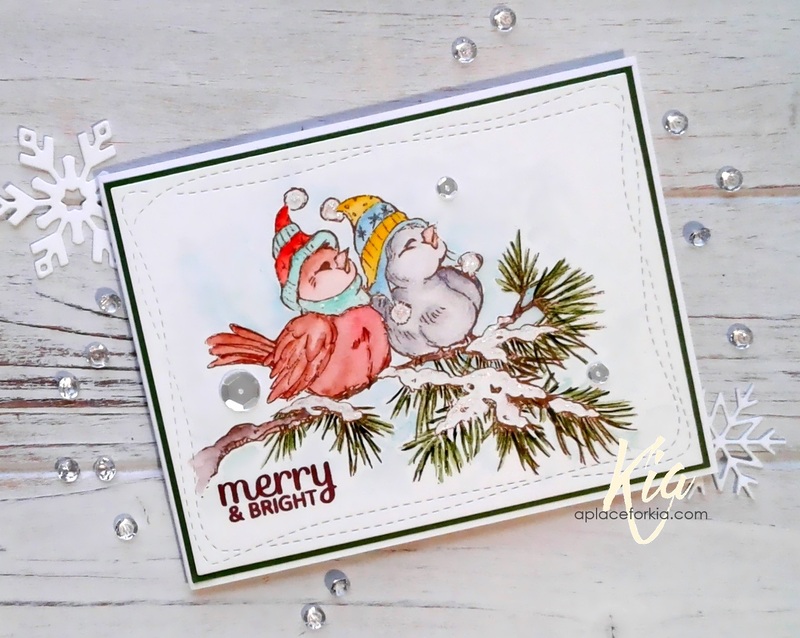 I had the ivy stamp in the middle of my Misti lid and just kept moving the paper to do the stamping, then did the same with the berries stamp, leaving the sentiment area clean for the sentiment, which I stamped in black. I die cut the panel using the wonky stitched rectangles and attached to the base with foam tape, then stamped and die cut another of the ivy and attached it to the panel on a foam dot. It doesn't get much easier than that. 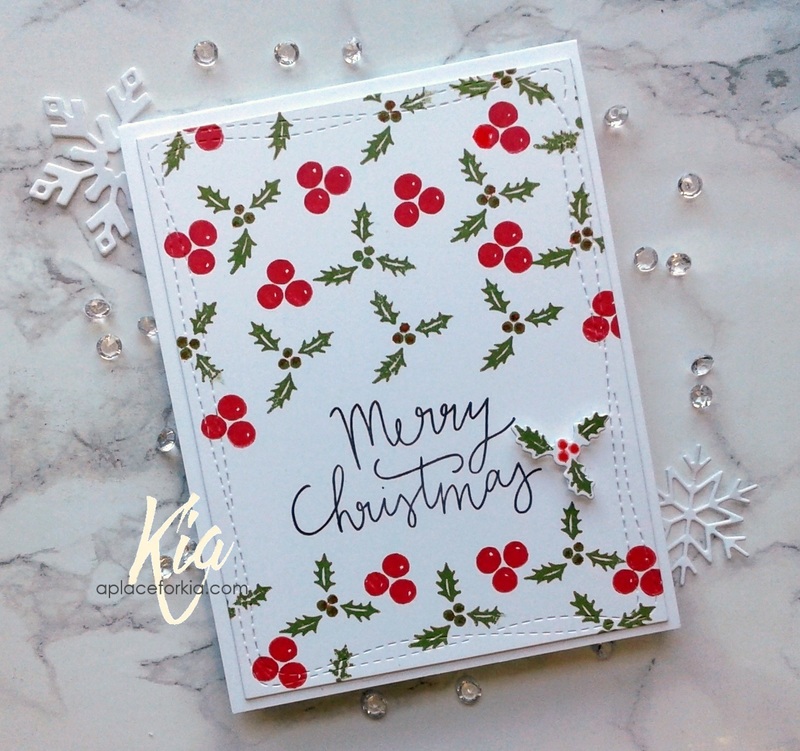 Products: Kaisercraft Merry Christmas Stamp and Die Set, Simon Says Stamp Wonky Rectangles Die Set, Ranger Archival Inks Vermillion and Library Green, Neenah Classic Solar White Cardstock, Foam Tape and dots. I had an odd shaped piece of Yupo left-over from who knows when. Not only was it an odd shape, it was rather small, and of no use for a background. So, ink it up and see what happens ... the result was these two cards, both made from left-overs. For the card above I die cut the bauble from the left-over and attached to the panel on foam dots. The bow was also cut from a left-over piece of gold glitter cardstock. This panel was on my desk so I placed it in my MISTI and stamped and heat embossed in gold the sentiment, then added a few sequins to finish. Along with the above bauble, I also managed to get this Candy Cane and Joy sentiment cut from the left over. 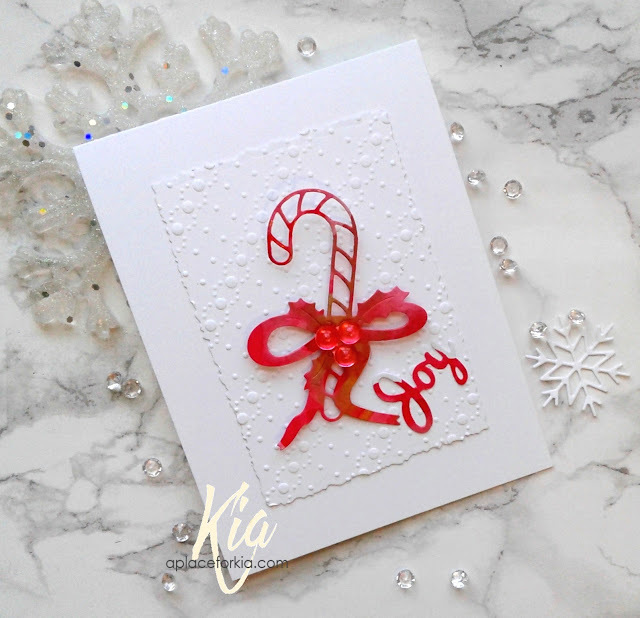 I had the piece of dry embossed cardstock that was also on my desk just begging to be used, and it was perfect for my Candy Cane which I attached using foam dots, and also added the sentiment. All this card needed was a few of the pink dew drops that I added to the Candy Cane, and that finished this card. I just love it when cards come together as easily as these did and I hope you enjoy them. Products: Frantic Stamper Finial Ornament Background, WPlus9 Hand Lettered Holiday Stamp Set, Frantic Stamper Candy Cane, Frantic Stamper Deckled Rectangles, CottageCutz Joy Die, Sizzix Snowflurries Embossing Folder, Neenah Classic Solar White Cardstock, Yupo, Tim Holtz Alcohol Ink Candied Apple and Gold Mixative, VersaMark Embossing Ink, Gold Embossing Powder, Dew Drops, Sequins, Foam Dots. 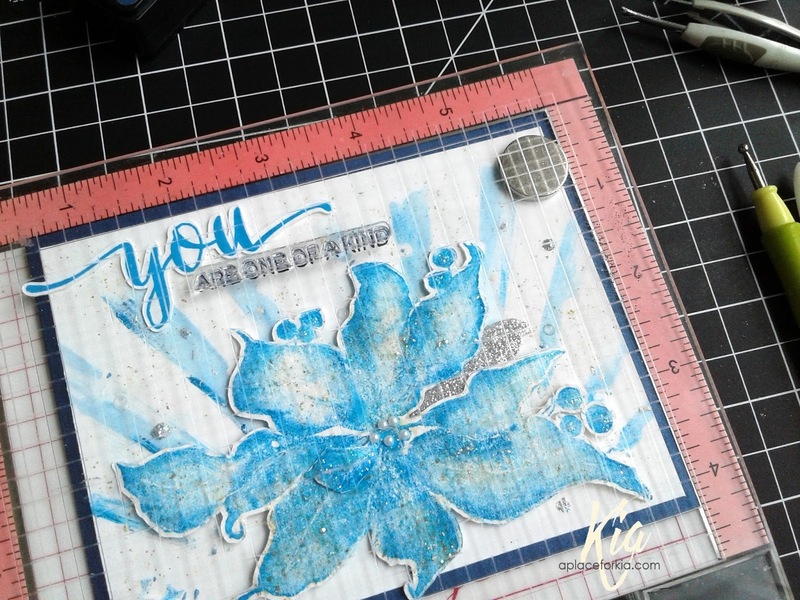 This is my sample card for the Clean and Simple challenge at Splitcoaststampers today. We are to make a thankful or thank you card, covering the U.S. Thanksgiving and the thank you for the rest of us - giggles. I made several of these alcohol backgrounds the other night, and this is one of them. I cut it down with the wonky rectangle and attached it to my Antique Gray card base on foam tape. The deer is die cut using silver glitter cardstock and shadowed with white cardstock then attached with foam dots, and has a red pearl for his eye. I added the trimmings frame and the thank you sentiment both cut in white cardstock along with a few sequins to finish. I had a lot of fun making this card ... thanks for visiting. Products: CottageCutz Deer Die, Simon Says Stamp Wonky Rectangles, Memory Box Scalloped Trimmings Stitched Die Set, Altenew Majestic Bloom Thank you Die, Tim Holtz Alcohol Ink Candied Apple, Silver Mixative, Neenah Antique Gray Cardstock, Neenah Classic Solar White Cardstock, Silver Glitter Cardstock, Yupo, Foam Tape, Foam Dots, Sequins. 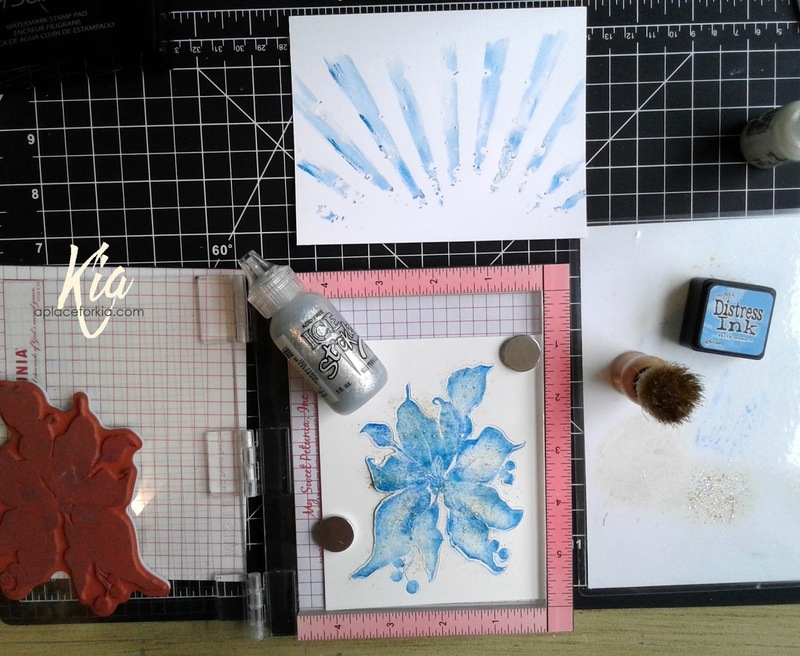 I had a chance to play along with the Featured Stamper challenge today at Splitcoaststampers. You can find the details here, and the card of Helen's I picked to case. I changed the background to dies and from red to gold, removing the gold from the border and using the wonky rectangle panel instead. I changed Santa to the right side of the card and omitted the sentiment, using the HoHoHo dies for that. Santa is water coloured with Zig brushes and his beard and fur have white gel pen along with clear Wink of Stella. I styled Santa and attached him with foam dots. A nice change of pace for this card today. Thank you for visiting. 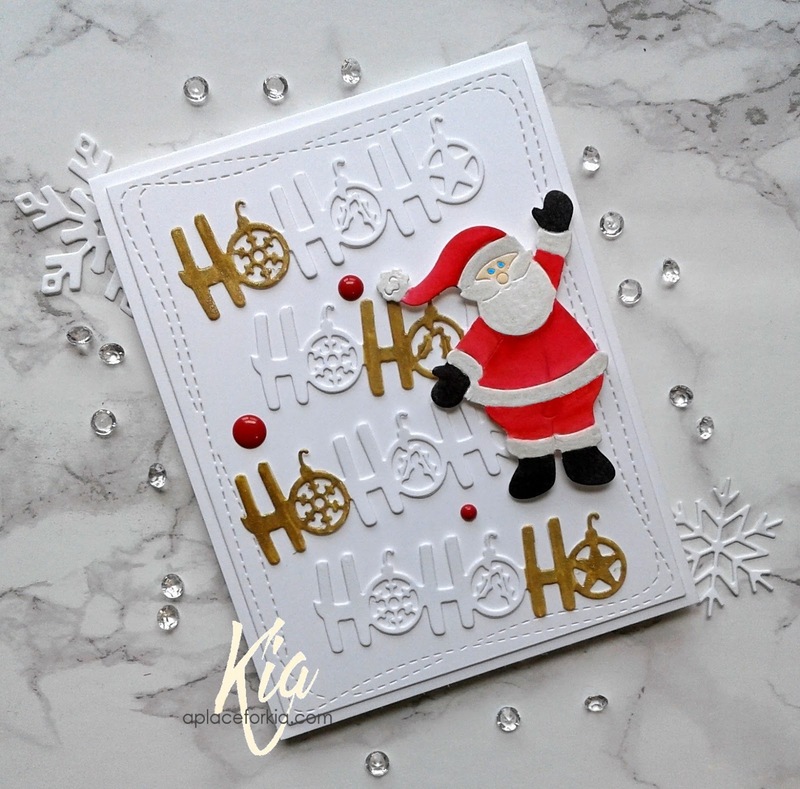 Products: Frantic Stamper Reaching Santa, Frantic Stamper Ornament HoHoHo Die, Simon Says Stamp Wonky Rectangles, Neenah Classic Solar White Cardstock, Fabriano Hot Press Watercolour Paper, Zig Brushes, White Gel Pen, Clear Wink of Stella, Gold Wink of Stella, YNS Gum Droplets, Foam Dots. I was playing around with alcohol inks last night to make some backgrounds that I need to finish some Christmas cards, and this is one of them. 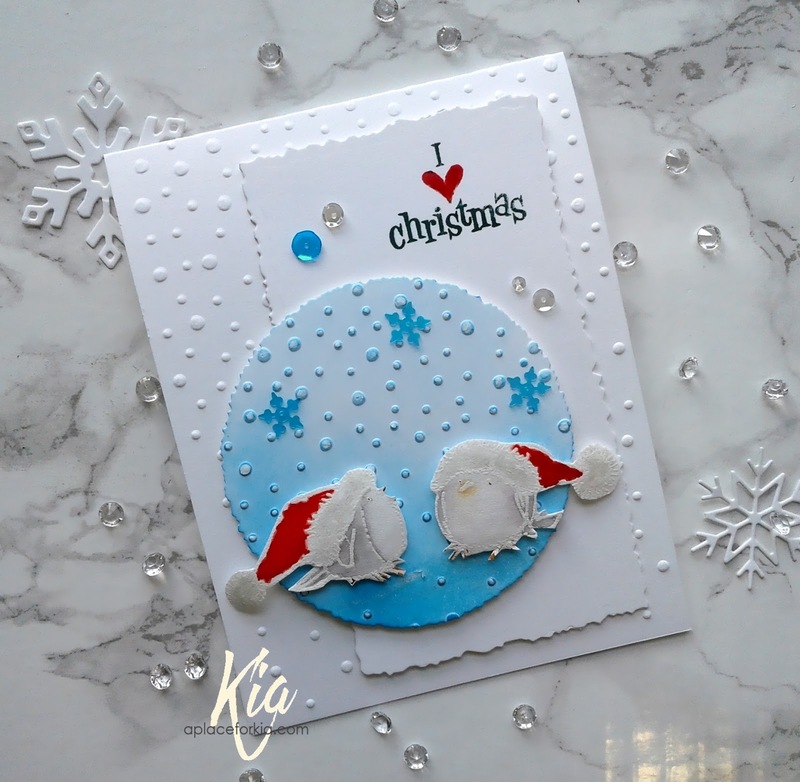 So easy to do and looks great on cards. I die cut the background using my deckled rectangle die, then embossed it with the brocade embossing folder. I die cut the poinsettia in white card stock and applied the veins in gold, and die cut 2 of the sentiment in the white and painted one with the gold. I very much like the background embossed, it adds a lot of texture to the card while still keeping it clean. 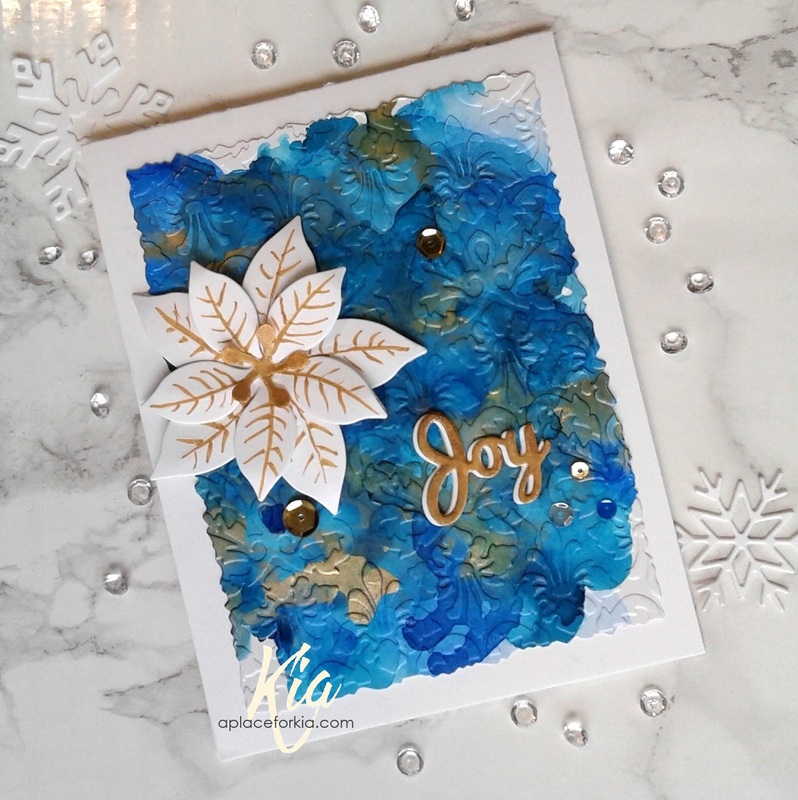 Products: Frantic Stamper Deckled Rectangles, Marianne Creatables Christmas Tree and Poinsettia, CottageCutz Joy Die, Cuttlebug Kassie's Brocade Embossing Folder, Neenah Classic Solar White Cardstock, Yupo, Tim Holtz Alcohol Inks, Tim Holtz Gold Mixative, Gold Wink of Stella, Sequins. I used the same snowflake die and stamp for these cards and by changing the technique I got two different Christmas cards. For the card on the left I stamped the sentiment and heat embossed with white embossing powder. I then sponged on my colours in a Ombre look but dark on ends to a light centre. I die cut the panel with the stitched rectangle die and mounted to the card on foam tape before attaching the silver glitter snowflake, which is also on foam dots. For the card on the right I stamped the image on my card base using the different colours in an Ombre look from dark to light at the top of the card. I added a double layer of the snowflake, with both layers having a layer of Wink of Stella on them. They are also attached with foam dots. Both cards received sequins, the right card having more than the left. I made both cards at the same time, so the two cards were done quickly and with different looks I think. 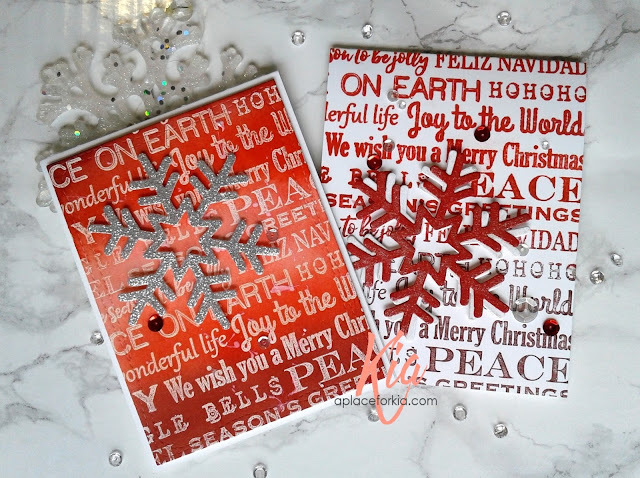 Products: Simon Says Stamp Believe in the Season, Simon Says Stamp Stitched Rectangles, Simon Says Stamps Funky Snowflake, Neenah Classic Crest Solar White Cardstock, Tim Holtz Distress Inks Barn Door, Candied Apple, Aged Mahogany, Foam Tape, Foam Dots, Sequins. 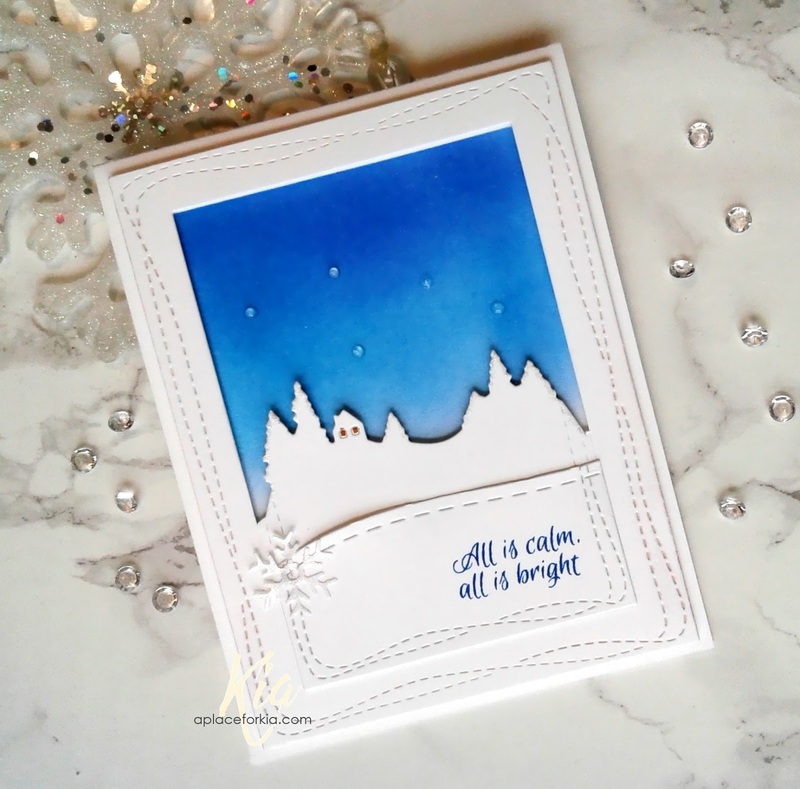 While I had the Winter Wonderland stamp set out the other day I stamped this image from the set, and set it aside to colour, which I did this morning before I misplaced it! I make cards for some friends to give to their grandchildren, and I think this will be cute for one of them. I water coloured the image using Zig Brushes and fussy cut. I dry embossed my card base, and die cut the tree ridge sponging on some colour. I die cut the slope from a textured cardstock that has some grit to it and sponged on a light blue then stamped the sentiment. Once I had all the pieces coloured and glued together I attached it to my card base. I styled the critter and attached him on foam dots ... he and his leaf are flying through the air!. Too cute. Products: Penny Black Winter Wonderland Stamp Set, Hero Arts Snowy Drifts Die Set, Simon Says Stamp Stitched Slopes, Sizzix Snowflurries Embossing Folder, Neenah Cardstock, American Crafts Cardstock, Zig Brushes, Tim Holtz Distress Inks Tumbled Glass, Pine Needle and Mowed Lawn, Ranger Archival Ink Vermillion, YNS Gumdrops, Foam Dots. 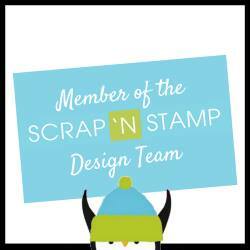 I am joining in with the Sketch Challenge at Splitcoaststampers today, which you can see here. It has been eons since I have done a sketch challenge, and I very much enjoyed the change today. For layers 1 and 2 I did a watercolour sky using French Ultramarine Blue, Prussian Blue and Manganese Violet. I did several layers before I was happy with the look, then sprinkled layer 1 with water and both layers with Kuretake Tambai White Gold paint. For layer 3 I stamped my sentiment using silver embossing powder, and matted for layer 4 using silver Wink of Stella. Layer 5 are my stars, which I coloured again using the silver Wink of Stella, and layer 6 I left as my card base. Layer 2, the violet sky is attached on foam tape and I finished with just a few sequins. Thank you for visiting today, I will be back tomorrow. In the mean time have a wonderful day. Products: Stampendous Starlight Sentiment, Simon Says Stamp Stitched Slopes and Stitched Rectangles, Frantic Stamper Deckled Circle, Spellbinders Small Nested Circles, Memory Box Stars, Neenah Classic Solar White, Fabriano Hot Press Watercolour Paper, Schminke French Ultramarine Blue, Winsor Newton Prussian Blue, Schminke Manganese Violet, VersaMark Embossing Ink, Kuretake Tambai Starry Colours, Wink of Stella Silver and Clear, Silver Embossing Powder, Foam Tape, Sequins. I do love Christmas and I love these little birdies, so this was an easy card to make. To start my card I die cut the deckled circle and the deckled rectangle. 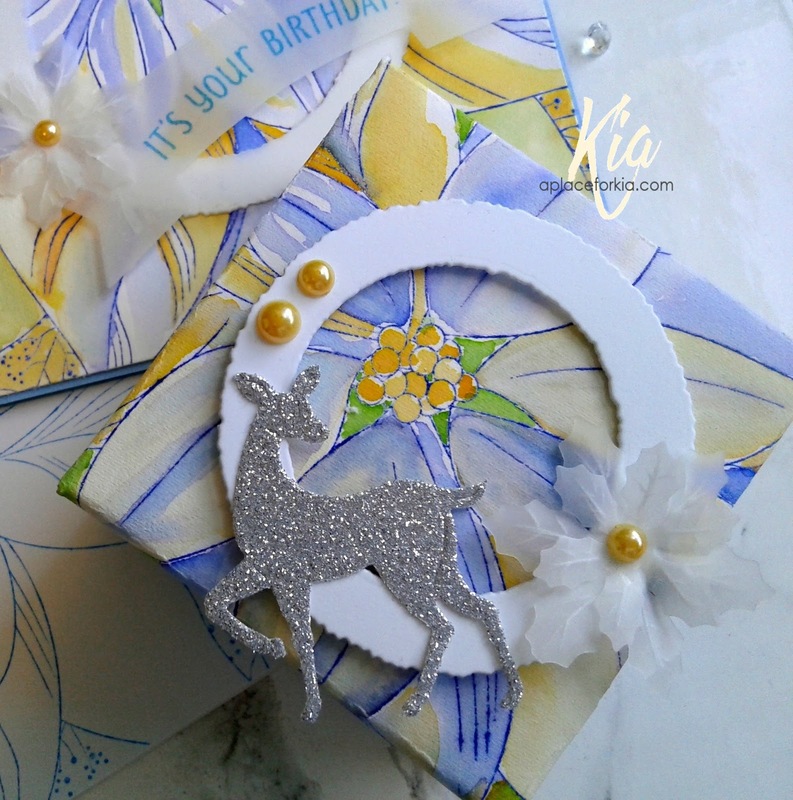 I then dry embossed my base card with the snow drops embossing folder, along with the deckled circle. On the circle I sponged on manganese blue, keeping it lighter towards the top. I added white gel pen to the dots of the snow. For the birds I stamped on watercolour paper and heat embossed with white embossing powder, then watercoloured using Zig Brushes. For the fur on their hats I coloured with white gel pen then added a lot of Wink of Stella and fussy cut once finished. I stamped the sentiment in green with the red heart on the rectangle and attached to my card base. I added foam tape to the circle before attaching, and added foam dots to the birds before attaching. A few snow sequins and regular sequins finished my card, along with more Wink of Stella at the bottom under the birds. Another card done and still more to go. Thank you for visiting today. Products: Penny Black Winter Wonderland, Frantic Stamper Deckled Rectangles, Frantic Stamper Deckled Circles, Sizzix Snow Drops Embossing Folder, Neenah Solar White Cardstock, Fabriano Hot Press Watercolour Paper, Ranger Archival Ink Shadow Grey, Manganese Blue, Vermillion, Library Green, Zig Brushes Red, Grey, Wheat, VersaMark Embossing Ink, Foam Tape and Dots, White Embossing Powder, White Gel Pen, Wink of Stella, Snow Sequins, Sequins. I was looking for a stamp like this and I finally found one, and I love the design of this particular stamp by The Ton. There are boundless possibilities ... and I will share another idea I have using this stamp on November 28, 2017 over on the My Sweet Petunia Blog, just in time for Christmas. This is a 6x6 rubber stamp and this image started out as a sample of me just playing around with it to get comfortable with it before actually using it. So I had stamped this on a smaller piece of watercolour paper that I had handy. But I liked it so much I turned it into an A2 card, which also shows that it does not have to be used for only large cards. I heat embossed the Poinsettia with clear embossing powder, then water coloured using Daniel Smith, Winsor Newton and Schminke watercolours in layers of colour until I was happy with the look. I trimmed up my piece and matted with green before attaching to my card base. The sentiment is die cut in gold glitter cardstock and I added the "& Bright" from another stamp set and die cut with the stitched label. As I was playing with this I did not keep track of the colours I used, but they did include a base of DS Medium Hue Cadmium Yellow, SC Transparent Orange, WN Cadmium Red Deep, SC Rose Madder, SC Scarlet Red and SC Permanent Carmine, along with SC May Green and WN Sap Green. 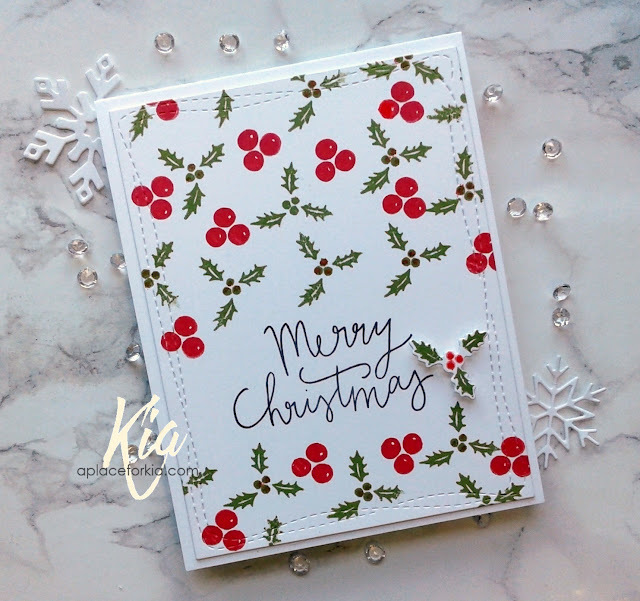 Products: Misti, The Ton Poinsettia, Right at Home Christmas Sentiments for the "& Bright", Frantic Stamper Merry Die from "Merry and Bright", Frantic Stamper Stitched Double Fishtail Label, Neenah Classic Crest Solar White Cardstock, Aura Green Cardstock, Fabriano 140lb. Hot Press Watercolour Paper, Gold Glitter Cardstock, Embossing Ink, Clear Embossing Powder, Daniel Smith, Schminke and Winsor Newton Watercolours, Ranger Vermilion Ink for the sentiment. Life is a song SING IT! 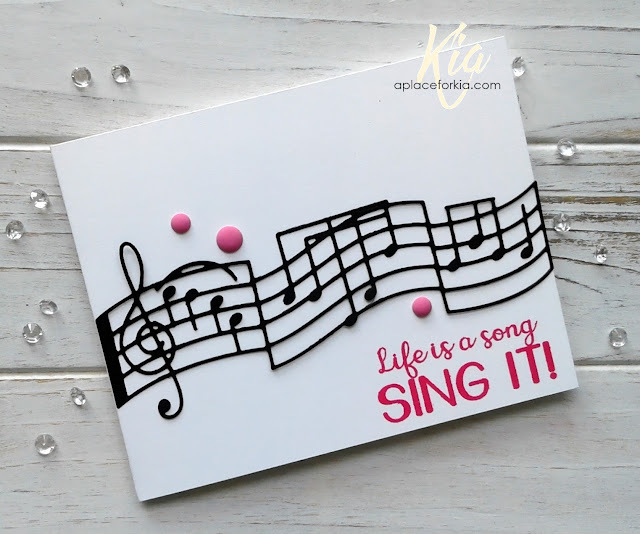 I love this sentiment and I love this Music Ribbon so I put them together to make a clean and simple card. A Life of Love and Music. This card comes together very easily. The die is cut from black card stock, but you don't need black to make this. With a little ink you can make your music ribbon any colour. 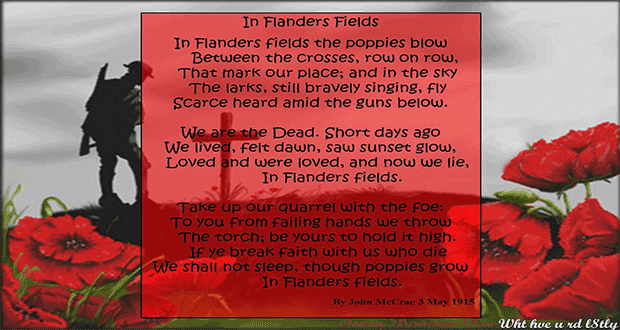 The sentiment is stamped using in a bright pink colour of ink. A few Sprinkles finished this card. 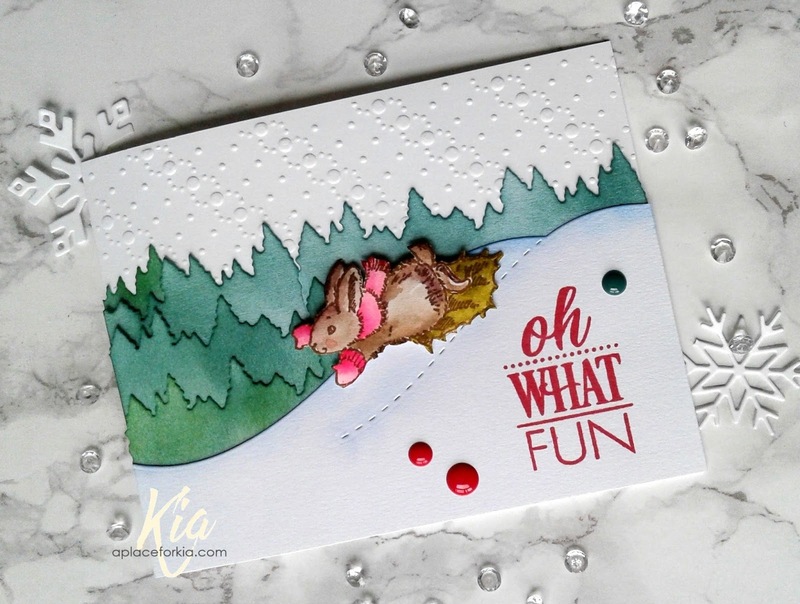 Products: Frantic Stamper Dies and Stamps, Neenah Classic Crest Solar White Cardstock, Aura Black Cardstock, Ranger Archival Vibrant Fuchsia Ink, Sprinkles. This is Hearts of Love featuring the newly released Musical Heart by Frantic Stamper. I love the simplicity of the musical note inside the heart, this is beautifully designed. 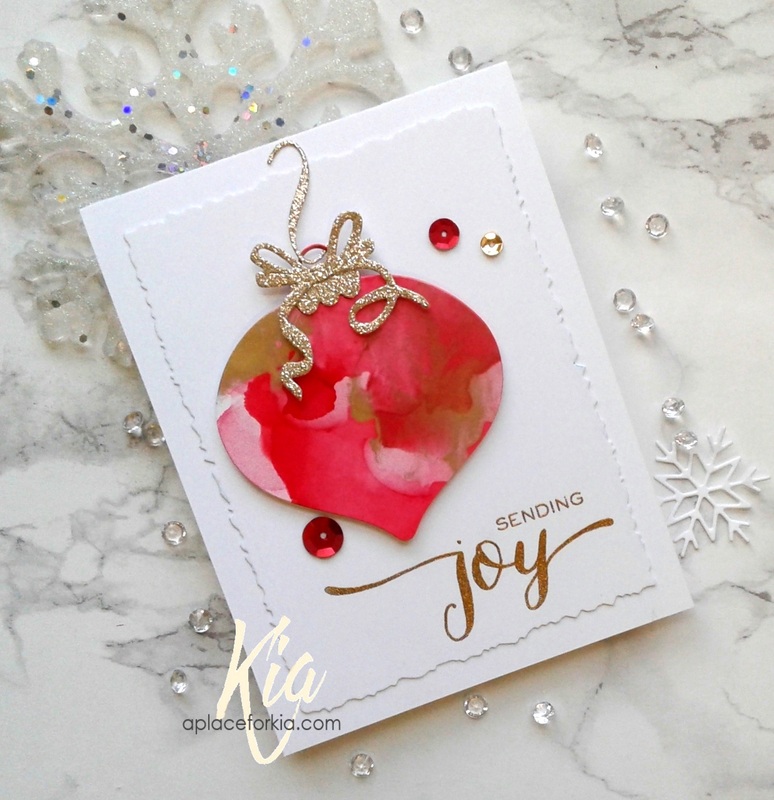 This is such an easy but effective card done in red and white. 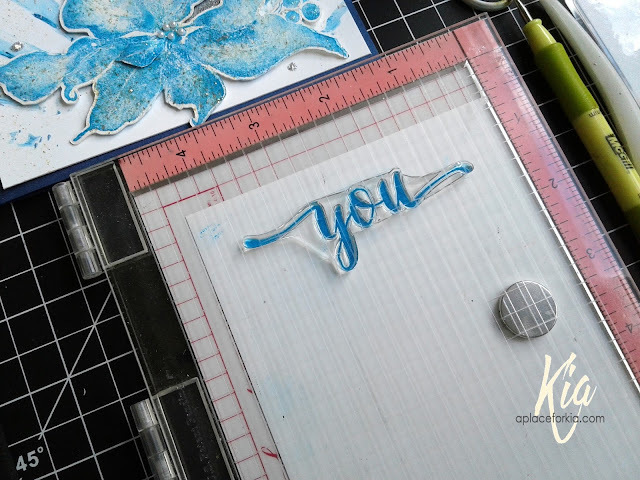 I embossed the background with my heart embossing folder, die cut the heart to match my card base and attaching on foam dots. I added the bakers twine and a couple of gems to finish. Thanks for having a look .... see you next time. 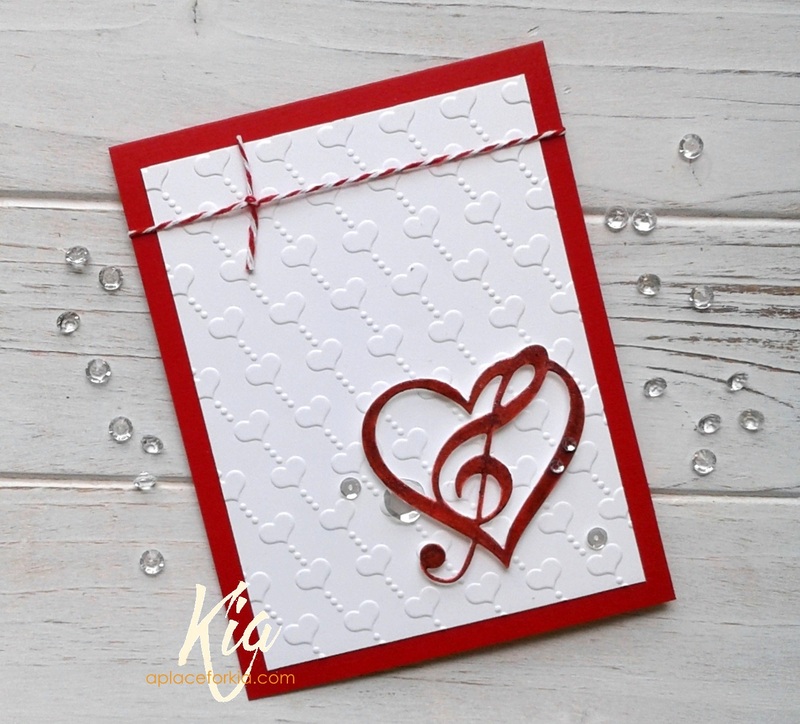 Products: Frantic Stamper Musical Heart, Darice Heart Background Embossing Folder, Aura Scarlet Linen Cardstock, Neenah Classic Solar White Cardstock, Bakers Twine, Foam Dots, Gems. This is "Sweet as Chocolate." 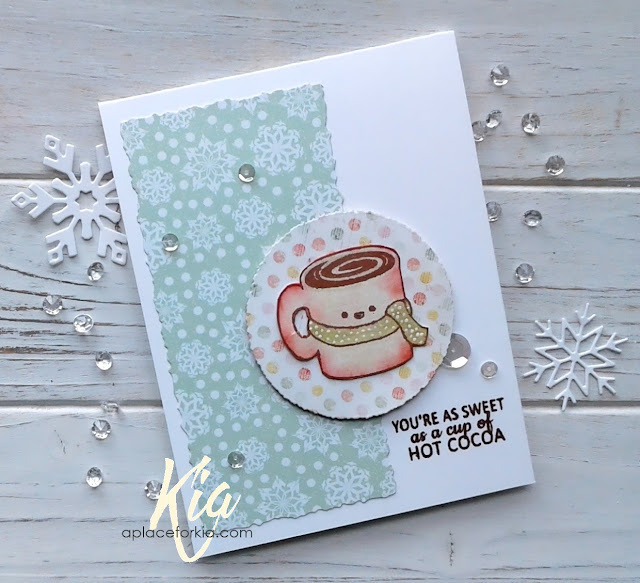 I had such fun playing with this new to me stamp set by SugarPea Designs, the face on the mug makes me giggle. I started my card by die cutting a piece of designer paper with my deckled rectangle and attached it to my card base. I then die cut the deckled circle from one of the co-ordinating papers, and I stamped the mug on another piece of the matching papers with sepia ink, then fussy cut before sponging on my colours. I added Wink of Stella to the chocolate as well as the scarf, then attached to the deckled circle, which I then attached to my base with foam tape. I stamped the sentiment in sepia and added a scattering of clear sequins to finish. This is a thank you card for a sweet lady, so I think it all fits together nicely. 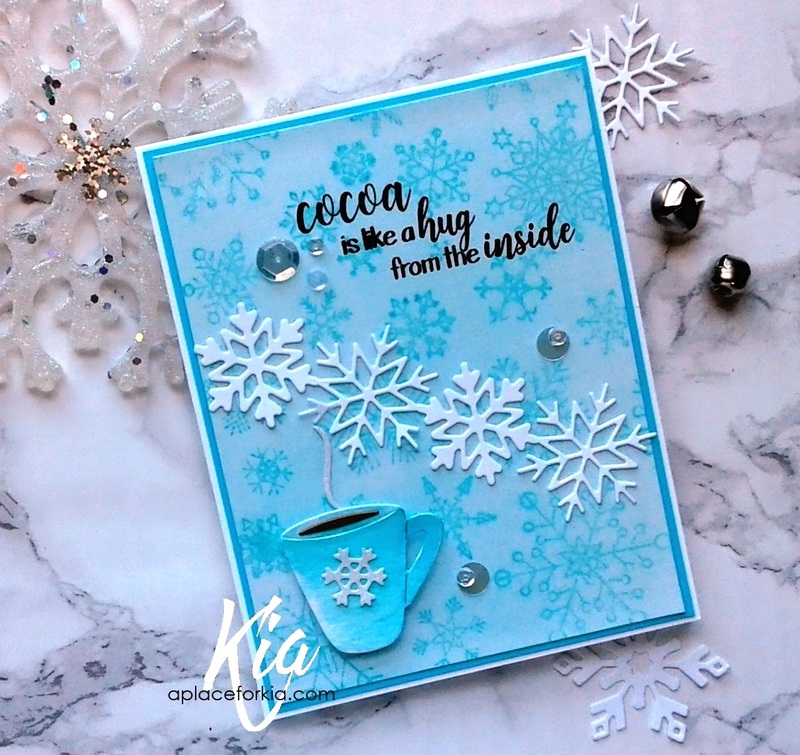 Products: SugarPea Designs Mugs and Kisses Stamp Set, Ranger Archival Sepia Ink, Tim Holtz Distress Inks Barn Door and Shabby Shutters, White Gel Pen, Neenah Cardstock, Prima Sweet Peppermint 8x8 Designer Paper Pack, Foam Tape, Clear Sequins.